Well, it’s that time of the year again. The Christmas tree has been taken down and New Year’s party preparations are in full swing. Along with the New Year’s celebrations typically come New Year’s resolutions – this is a time for us all to pause and reflect on our lives and things we want to do better in the upcoming year. Inevitably the most-made resolution is to “lose weight” or “be more healthy” – but rarely do people come up with a concrete plan on how to make that happen. One of the best ways to improve your fitness is to increase your daily activity and make this change permanent. I know sometimes it’s difficult to get in some activity in the winter months, but it certainly doesn’t have be! 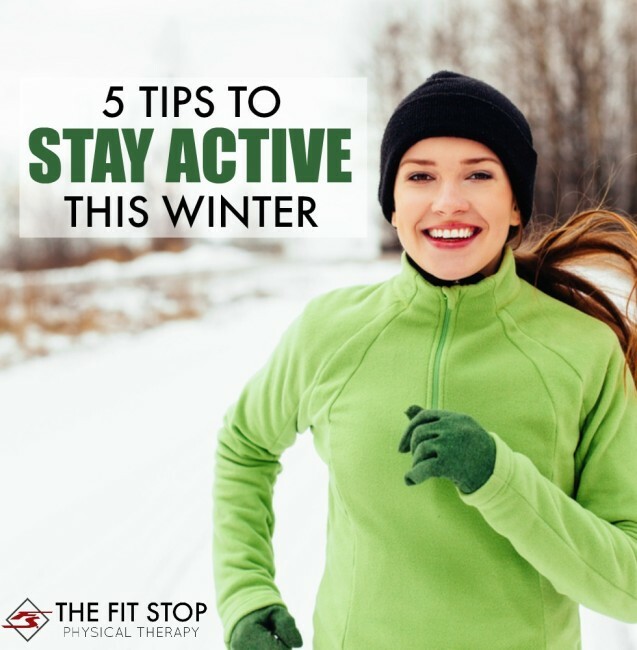 Today on the Fit Stop Blog one of our exercise specialists, Jared Beckstrand, PT, DPT, is sharing 5 of the absolute best ways to increase your daily activity even when the weather outside is frightful! Keep reading for more! 1. Find an outdoor activity that you enjoy doing – Living in Utah, we’re surrounded by a veritable outdoor mecca for activity enthusiasts. Snow skiing, snow boarding, snow mobiling, snow shoeing, cross-country skiing, ice skating, hiking, and running are among my favorites. Just make sure you prepare for the weather appropriately with the right layering of your clothing. 2. Find an indoor activity that you enjoy doing – Just because it’s cold and wet outside, that doesn’t mean that there isn’t plenty of activities to take part in indoors. Hitting the gym, basketball, racquetball, swimming, volleyball, and spinning are among my favorite activities, but there’s also Zumba, Yoga, indoor workout videos, and shopping (don’t tell my wife about that last one) that offer great ways for you to increase your wintertime activity. 3. Find a friend with similar goals and interests – One of the best ways to ensure your compliance with any workout plan is to enlist the help of a friend to keep you going. Scheduling workouts, walks, trips, outings, etc with someone not only improves your compliance and the likelihood that you’ll actually follow through with everything, but makes the activity a lot more enjoyable, also! 4. Schedule time to make it happen – The winter months can get busy. The days are a lot shorter but yet the activity quota remains about the same. Between school, practices, lessons, games, and whatever other activities you and your family may be engaged in it’s easy to forget to take time for yourself. One way around this is to get your activities down on your schedule beforehand. Scheduling time for yourself ensures that you won’t forget to take the time to worry about your own personal fitness this winter. 5. Re-think your recreation – Think about the last date night you went on. Dinner and movie? Sitting and eating? What about the last time you got together with friends? Probably sitting around the table talking and eating? Game night and date night are actually a great opportunity to get a little more activity into your day! Think of something fun and active to try out – bowling, ice/roller skating, laser tag, and scavenger hunts are among my favorite. You can get in a lot of activity and create a lot of really amazing memories if you put in the effort to make it happen. So don’t let this winter get you down! Use these months as an opportunity to stay active, stay fit, and stay healthy! Number three is the best way to really do anything, for having that person there is a really nice motivation. They can help challenge you to go farther, and help remind you of your goal when you think about quitting, and you do the same for them. Having this friend can help both of you become more healthy. I used to do physical therapy exercises with my sister when her knee was giving her problems. I feel we really helped each other, but stopped when she was fully healed. We should start it up again. You make some wonderful points, Phillius! Thanks so much for sharing with us!